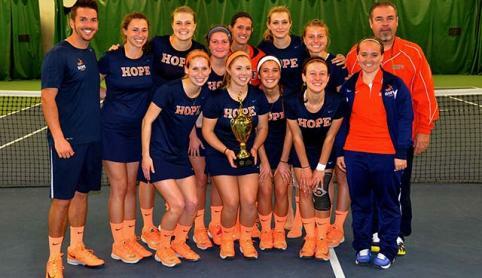 The Hope College women's tennis team swept singles play to claim a 5-2 win against Wheaton, Ill. on Thursday in a first round match the NCAA Division III championship. The Flying Dutch improved to 17-5 overall and will advance to a second-round matchup on Friday with eighth-ranked Carnegie Mellon (Pa.). The match will be played at the University of Chicago beginning at 10 a.m. CT. The winner will advance to Saturday's regional final at noon CT. The Flying Dutch are competing in the NCAA championship for the third consecutive year and the ninth time in school history.